When combined with shameful 20-minute headways, the two or three minutes* it takes to descend to, or emerge from, a Metrorail platform add up to a substantial fixed time penalty on short trips within the core. 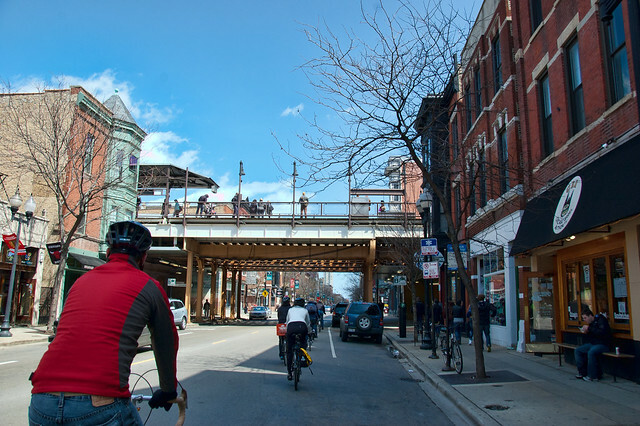 It isn’t just the flowing mezzanines and interminable escalators, either: even in dense residential neighborhoods, stations often empty into meaningless plazas rather than seamlessly meeting the neighborhood. 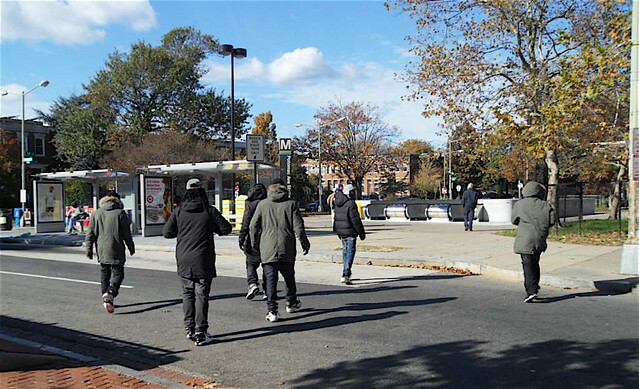 Over time, buildings will grow towards the station (as at Columbia Heights), but this process takes decades and has often been stymied by poor planning decisions. This is not to absolve Chicago: it arguably invented the expressway median transit line and thus spawned places like Rosemont — which Yonah Freemark called “the Land of Missed Opportunity” for its uniquely awful transit-adjacent development pattern. The town of Rosemont** obviously understands that its “L” access gives it a valuable advantage over more distant suburbs. However, its station area pedestrian experience is just monumentally bad, with an uncharacteristically lengthy “L” station emptying out into a bus parking lot in the middle of an interchange. 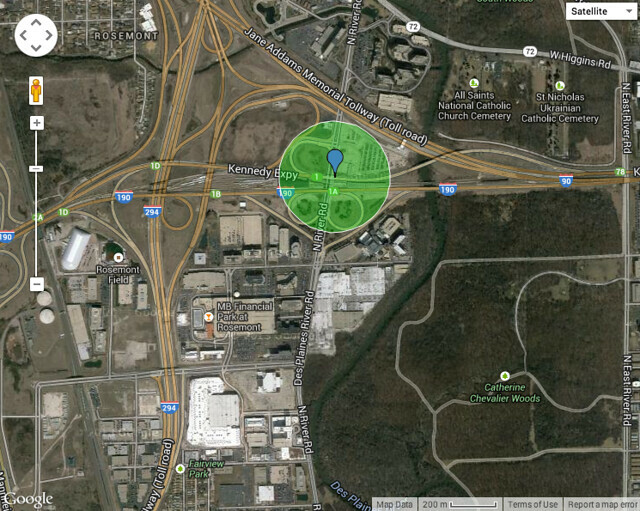 The net result: absolutely nothing, besides said bus terminal, is within the five-minute walk shed (below). Rosemont has attempted to compensate by subsidizing all-day circulator shuttles to feed its new retail/entertainment hub, but no shuttle can match the spontaneity of a quick lunchtime walk. 3. The adjacent land uses either want to shy away from the freeway’s noise and smoke, or surround themselves with moats of parking and limited access routes, or both. Many of the inexpensive freight-rail alignments used for recent light-rail projects suffer from a similar (although less extreme) distance from the urban fabric. 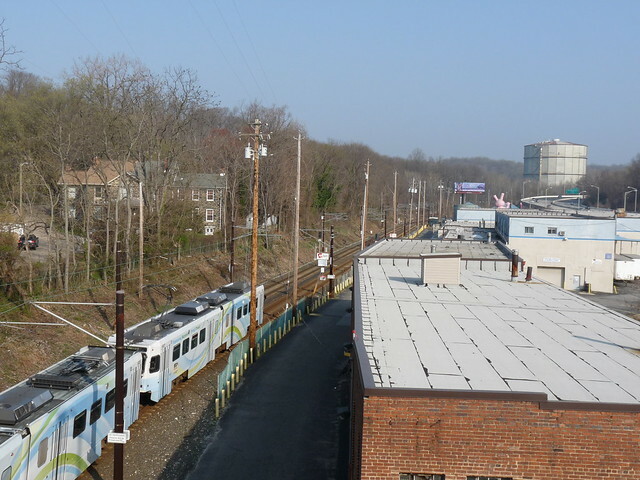 The north end of Baltimore’s light rail line runs in the former Baltimore & Susquehanna (B&S) Railroad ROW north to Timonium, alongside a stream valley, separated from adjacent development by buffers, grade changes, woods, and (to the east) the Jones Falls Expressway. 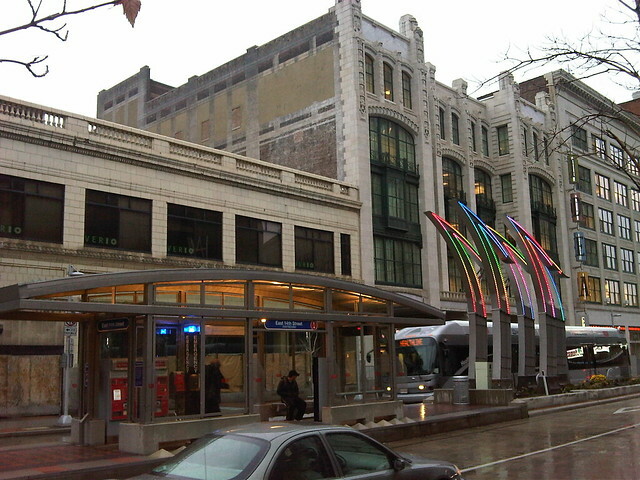 The LRT corridor passes many major activity centers on the north side of Baltimore, including two campuses of Johns Hopkins University, parks encompassing the stream valleys and adjacent hills, the Woodberry area of redeveloped mills, prosperous neighborhoods like Hampden and Roland Park, and at the northern end the backs of retail and business complexes facing York Road in the northern suburbs. However, historically development of residential and retail uses focused on the hills above the stream valley and freight railroad; the only uses directly fronting onto the railroad today are station access uses and some renovated mills. Jeff Wood notes that Minneapolis is about to embark on a similar mistake with its Southwest LRT project. 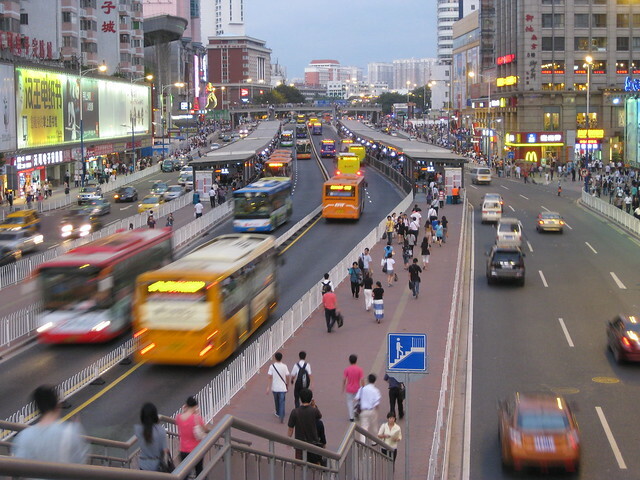 In short, to genuinely intertwine transit with city life, it has to be as close & convenient as physically possible. Don’t cheap out on an inexpensive but inconvenient alignment, don’t over-engineer stations, and seek the smallest possible station footprints that will do the job. These principles should seem obvious, but too many new transit projects still don’t get this interface right. I’ll explore some more examples in two future posts. 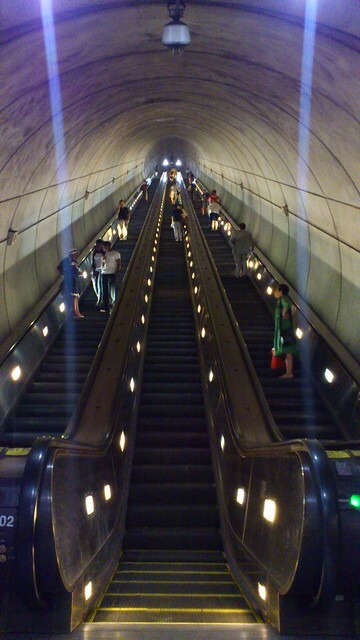 * Times measured at Rosslyn and Court House.